Qu'une goutee de vin tombe dans un verre d'eau; quelle que soit la loi du movement interne du liquide, nous verrons bientôt se colorer d'une teinte rose uniforme et à partir de ce moment on aura beau agiter le vase, le vin et l'eau ne partaîtront plus pouvoir se séparer. Tout cela, Maxwell et Boltzmann l'ont expliqué, mais celui qui l'a vu plus nettement, dans un livre trop peu lu parce qu'il est difficile à lire, c'est Gibbs dans ses principes de la Mécanique Statistique. Let a drop of wine fall into a glass of water; whatever be the law that governs the internal movement of the liquid, we will soon see it tint itself uniformly pink and from th at moment on, however we may agitate the vessel, it appears that the wine and water can separate no more. All this, Maxwell and Boltzmann have explained, but the one who saw it in the cleanest way, in a book that is too little read because it is difficult to read, is Gibbs, in his Principles of Statistical Mechanics. La valeur de la science. In Anton Bovier, Statistical Mechanics of Disordered Systems (2006), 3. The laws of thermodynamics, as empirically determined, express the approximate and probable behavior of systems of a great number of particles, or, more precisely, they express the laws of mechanics for such systems as they appear to beings who have not the fineness of perception to enable them to appreciate quantities of the order of magnitude of those which relate to single particles, and who cannot repeat their experiments often enough to obtain any but the most probable results. Elementary Principles in Statististical Mechanics (1902), Preface, viii. This irrelevance of molecular arrangements for macroscopic results has given rise to the tendency to confine physics and chemistry to the study of homogeneous systems as well as homogeneous classes. In statistical mechanics a great deal of labor is in fact spent on showing that homogeneous systems and homogeneous classes are closely related and to a considerable extent interchangeable concepts of theoretical analysis (Gibbs theory). Naturally, this is not an accident. The methods of physics and chemistry are ideally suited for dealing with homogeneous classes with their interchangeable components. But experience shows that the objects of biology are radically inhomogeneous both as systems (structurally) and as classes (generically). Therefore, the method of biology and, consequently, its results will differ widely from the method and results of physical science. Atom and Organism: A New Approach to Theoretical Biology (1966), 34. We avoid the gravest difficulties when, giving up the attempt to frame hypotheses concerning the constitution of matter, we pursue statistical inquiries as a branch of rational mechanics. Elementary Principles in Statistical Mechanics (1902), ix. 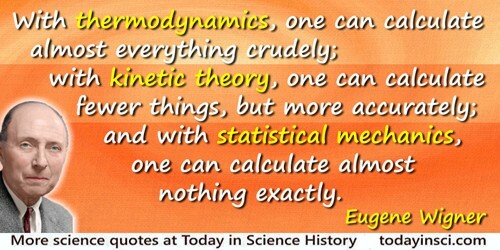 With thermodynamics, one can calculate almost everything crudely; with kinetic theory, one can calculate fewer things, but more accurately; and with statistical mechanics, one can calculate almost nothing exactly. Edward B. Stuart, Alan J. Brainard and Benjamin Gal-Or (eds. ), A Critical Review of Thermodynamics (1970), 205. You should call it entropy, for two reasons. In the first place your uncertainty function has been used in statistical mechanics under that name, so it already has a name. In the second place, and more important, no one really knows what entropy really is, so in a debate you will always have the advantage. From the recollection of Claude Shannon given in discussion with Myron Tribus (Apr 1961) about the reason Shannon chose the word “entropy” for his information function (first used by Shannon in a 1945 memorandum at Bell Labs). The suggestion from Neumann to use “entropy” dates back to a Neumann-Shannon conversation c.1940. Shannon’s recollection of the Neumann’s recommendation was quoted as recollected by Tribus in Myron Tribus and Edward C. McIrving, 'Energy and Information', Scientific American (1971), 225, 179-88.